I know with the rain pouring down here in the UK, it seems like summer is a distant memory, but I promise you it isn’t. I love nothing more in summer than going for a long, lazy picnics in the park, or in the evening having a few people over for drinks and nibbles on my balcony. Crack open the Pimms, open a couple of punnets of strawberries and nibble on some classic sponge cake and it’s a perfect gathering. It’s very British of me, but I love all of that. Which is why I’m going to be hosting a few friends over on the evening of the Queen’s Official 90th Birthday on June 12th. Any excuse to have a good knees up… again a very British thing to say. It doesn’t matter if you don’t have much space, it’s more how you utilise it. I always decorate my balcony, as it adds so much character. I’ve done flower garlands for a festival style gathering, and had lanterns dotted about. This time for my Queen’s Birthday gathering, it’ll be bunting strung up with pots of red, white and blue flowers. If your hosting a party, I can’t recommend a theme enough. Even just co-ordinating colours of plates and napkins will bring it together. If you go to craft shops, there are so many little decorations and bits you can get to make your own place settings and table decorations, which are a lot cheaper than buying pre-made. For the Queen’s Birthday celebrations, I’ve teamed up with Dr. Oetker, the baking experts hack one of their Queen’s 90th cupcake recipes. Everyone always thinks strawberries and cream when it comes to British summer, but personally, I’m a bit meh about strawberry jam anyway. The fruit, definitely, but jam, I’m not too fussed about. But what I do love is salted caramel. Salted caramel makes everything better and mix it in cake and it is amazing. Add a crown on top and well, you just have the best party treat ever. So simple to make, and yet you’ll wow your guests with these beauties. So here is my Royal Salted Caramel and Cream Tea Fairy Cakes. 1. Preheat the oven to 190˚c/ gas mark 5 and put the 10 fairy cake cases into a baking tin. Mix the margarine in a mixing bowl with the caster sugar, egg and Vanilla until a smooth paste. Then sift the flour on top and using an electric whisk and gently whisk the ingredients together until creamed together. 2. Divide up between the cake cases and bake for 16 -18 minutes until risen and lightly golden. 3. WHILST STILL WARM, put the nozzle of the salted caramel filler into the centre of the cupcake, top down and squirt until the caramel starts to overflow the top. Repeat and then allow the cakes to cool completely. 4. To decorate, roll out roughly the red and blue Ready to Roll icing separately until pliable, then cut each into 5 pieces and roll into a ball. Then cut a deep cross in the top of each and sort of roll the side of the base of each ball between your fingers to make it narrower than the top. A little like chefs hats. 5. Knead 50g of the yellow Icing to again soften and roll out the yellow icing thinly to form a rectangle approx. 8 x 15cm (3 x 7 inch). Cut 20 thin strips, approx. 0.5cm (1/4 inch). Cross 2 strips across each ball, over the cross cut and stick in place using a little water. 7. Next whip up your buttercream and fill into a piping bag. Pipe a generous swirl on top of each cake and then top with a crown. I think the Queen herself would be proud of these! But if you feel like you really need to wow the socks off your guests, Dr. Oetker have made this pretty fabulous cake with baking expert Juliet Sear. Its nine tiers of British-ness. Those cute Corgis, bunting, and of course the Union Jack. So would you like to win it? Who wouldn’t! 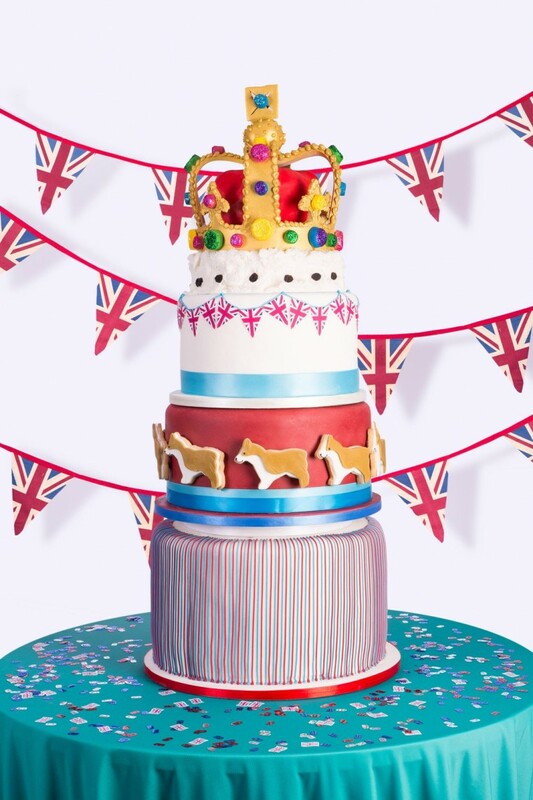 Head to Dr. Oetker’s website: http://www.oetker.co.uk/uk-en/the-queens-birthday/win-a-cake-for-your-party.html and fill in the form to enter. You’ll be the envy of everyone this summer with that cake! Tag me in your photos of your cakes on Twitter or Instagram @laurajhyatt as I’d love to see. Happy baking everyone. That literally looks like the dream!